Every woman needs a little me time but it’s often hard to accomplish with all of our duties around the house, with the kids and our jobs. 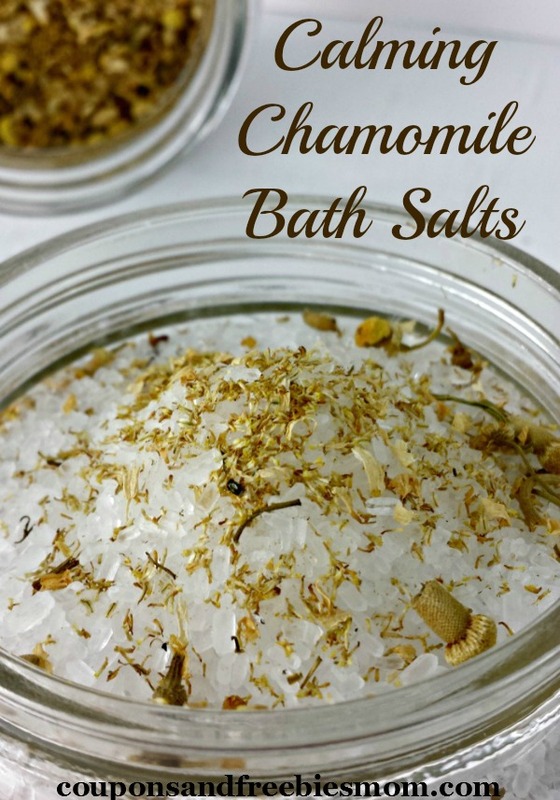 These Chamomile Bath Salts are an easy way to sooth your body while being budget friendly by using inexpensive supplies you can find in your local grocery store or perhaps even your own home. Not only is this great for personal use, it also makes a wonderful gift for those you love. Add the Epsom salt to a medium bowl, and add the essential oil. Stir to combine. Mix in the dried chamomile. Using the funnel, pour the salts into the jar. Print this great Label to add a special flare to your gift if preparing to give to others! You may store these Calming Chamomile Bath Salts in any airtight container or for gift giving pick up some attractive plastic jars, bowls or tins that are decorative and would be useful in gift giving. Decorate with a bow and a simple note of love and this makes the perfect homemade birthday gift, Valentine gift, anniversary gift or little treat just because.